Now that I'm finally happy with tile set for the Gassy Swamp, I've decided to release a new level, 3-2. It features more of the same as 3-1 but also some shallow muddy water which hides "bean shooters" plants, which is a surprise that I've mentioned the last time. They are not hard to disable or avoid, but could surprise you if you don't expect them. Oh, I guess I just spoiled the surprise. Never mind, the level is challenging enough. I'll wait for some feedback by the early adopters and potentially add some bean soup to make it easier. Also thinking of going back to Cursed graveyard and adding bean soup to at least one or two levels there. I've realized changes to the platform outlines for world II do not work as intended so I've decided to revert them to the previous look. Then I added some minor tiles to world III to improve the overall experience... and earlier today I've created a new monster for the swamp and fixed a small audio glitch for one of the existing enemies there. Not one of these things would make me release a new version immediately - not when I'm in the process of designing a brand new level and a new version is planned already anyway - but I've also improved the high score / end screen by adding rating of your play trough expressed in golden stars - and I wanted to add that to demo too, so everyone can see it and... We have 0.0.3.1b / 0.0.2.16 now. Yay! 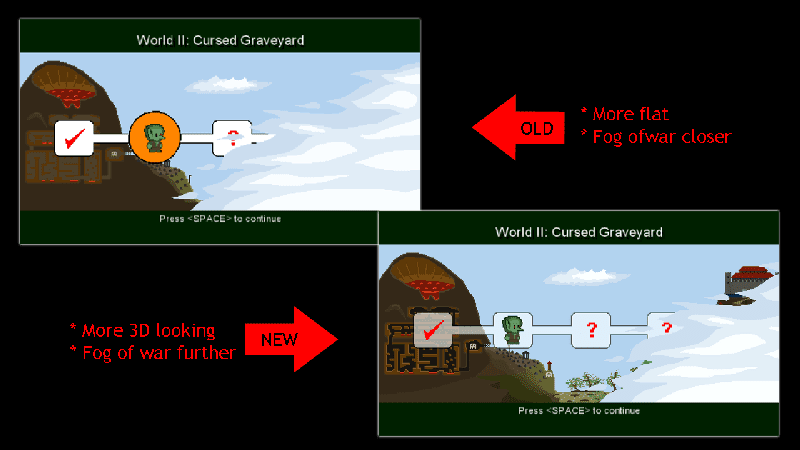 I'm currently working on assets for world 3 (most tiles and a few of new enemies are ready to be implemented) and while making a map screen for it, I've decided to improve the entire map visually, but also to push the fog of war a bit further away so players can see one world ahead, and not just the world they are about to play. I hope this will provide additional motivation for finishing unlocked worlds and continuing with the game. Demo has been updated to the latest version.